Once downloaded, and extracted, you will see 2 flavors of CLI, a Windows-friendly batch file, and a Unix/Linux-friendly shell script. Since Macs are based on a flavor of BSD, I chose to open up the esscs.sh file in a text editor. Regardless of which flavor of CLI you intend to use, you will have to tell it where Java resides, i.e. the JAVA_HOME parameter. As you can see, the base download of CLI has this commented out. You need to at least have Java 1.8 installed on your machine. If you open a terminal session, and type, “java –version”, you should be able to confirm if you have Java installed, and which version it is. 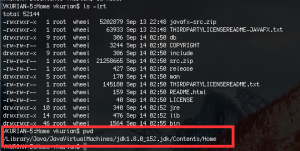 I preferred not to have JAVA_HOME explicitly set as an environment variable on my Mac, but to have its path referred to in the CLI shell script. I had multiple installs on my machine. Since we know we need the latest version, we can just grab the whole path. Now, all we need to do, is uncomment the line in the CLI script, and paste the path. Also, note that I made a copy of the “esscs.sh” script, so as to be able to track back changes. I had to change permissions on the script, to be able to execute it. I chose to leave it wide open (not recommended). I was now able to login without issues. Interestingly, as my password had special characters in it, I had to add “” around the text to get it to work correctly. And there you have it, a brief look at how to set up CLI on Macs (or Linux/Unix). automation, cli, essbase cloud, esscs, mac. Bookmark.